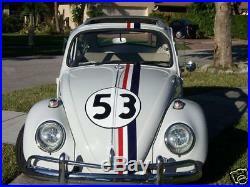 These are exact replicas of the decals on the original Love Bugs. The original font, colors & sizes have been matched for authenticity. We spent considerable time matching up the font (created by Disney exclusively for the "53") that was used in the original movie. These are printed, 1 piece, decals, NOT layered cut vinyl. Check their feedback and look at ours. We strive for 100% satisfaction from our customers. We offer sizes that will fit either early model or late model Beetles. Please specify year of vehicle at checkout. Solvent Printed on 2.5 mil vinyl. "Removable" adhesive allows decals to be safely removed for up to 7 yrs. Without harming the underlying paint. Laminated with a 2 mil. Clear laminate for added abrasion resistance. V inhibitors to prevent fading from extreme sunlight. We use only the highest quality, longest lasting materials available. Beware of inferior products that will easily scratch, quickly fade, or harm your vehicle's paint. Installation instructions will be emailed upon request. More than enough striping for all models. Custom sizes, colors and fonts are available. 1 "53" Gumball- (17.50). 3 Rally Stripes- 5.5" x 72" (All 3 colors are printed on one stripe). Specifications: Late Model including 2012. 3 Rally Stripes, same as above. Check our feedback - Our customers love our products! These are professional products and professional installation is recommended but not required. 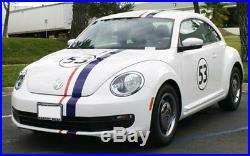 Herbie The Love Bug Decals Vehicle Graphics Stickers & Late Model Kits" is in sale since Saturday, April 14, 2012. This item is in the category "eBay Motors\Parts & Accessories\Car & Truck Parts\Decals/Emblems/License Frames\Decals & Stickers\Graphics Decals". The seller is "1deaddude" and is located in Orlando, Florida. This item can be shipped worldwide.